Whip together the yogurt, sugar, and cream cheese until fluffy. Spoon into your pie crust. Mound sliced bananas on top of the pie. Top with your favorite toppings. Enjoy! Too hot to bake? Try this chilly no-bake summer dessert recipe and cool down! A friend texted the other day to tell me it was 117 degrees in South Carolina. One hundred and seventeen degrees! The major summer heat wave may have passed us by, but that doesn't mean it's time to fire up the oven! 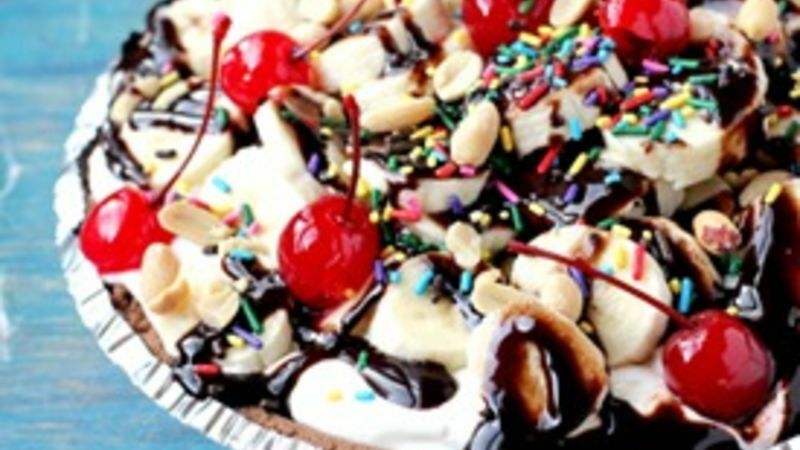 It's still hot outside and there's no reason for you to be caught inside when you could be spooning up this delicious No-Bake Banana Split Ice Cream Pie in no time at all! Grab yourself a chocolate or graham cracker crust. Either one will do, but we decided to go for chocolate because chocolate is the bomb diggity. Top with your favorite banana split toppings. It's that easy, for reals! That's right ... if we know what's good for us in the summer, we all scream for ice cream (desserts)! So, here are lots more ice cream dessert recipes to help you chill out!